Our full color Coroplast lawn signs are perfect for political campaigns, yard sales, real estate, or to promote your business. 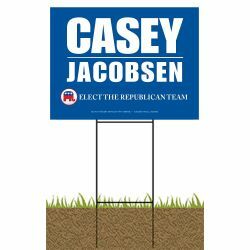 They are great if you want a maximum impact from your coroplast lawn signs. H-stake wire step stakes are best used on a soft ground environment (dirt/soil/grass, etc.). The lawn signs once printed, may show a linear effect due to its' corrugated flute structure. Ink is UV Cured (dried). Quick 7-9 day production time. For other sizes or large quantity silk screened signs please email or call 860-350-8016.